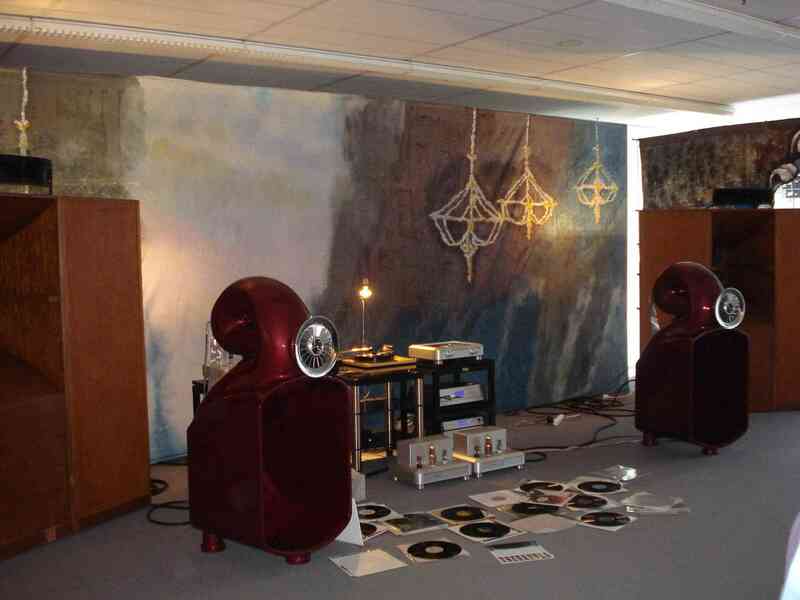 When Thomas Mayer informed us that he had set up private demos of his superb tube amp gear during the weekend of the 2010 High End in Munich, Germany, it was a must for Austrian loudspeaker designer David Haigner and myself to visit. A hotel was quickly booked, David's new and superb 3-way loudspeaker Tau was carefully packed and we left on Friday May 7, 2010 to visit Thomas. 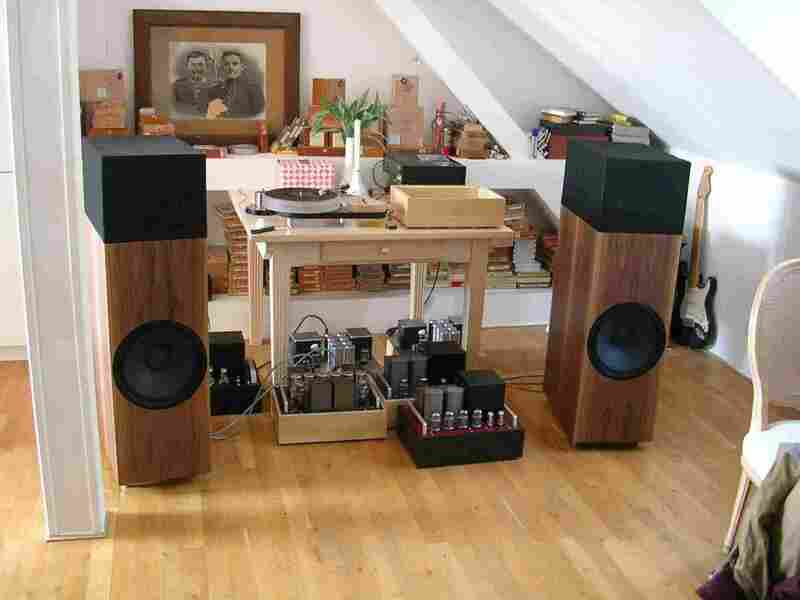 Since he uses David's smaller two-way speaker Rho to test and fine tune every pre- and power-amplifier he builds before an amplifier is delivered to a customer, Thomas agreed to also demo David's Tau speakers at this listening occasion. 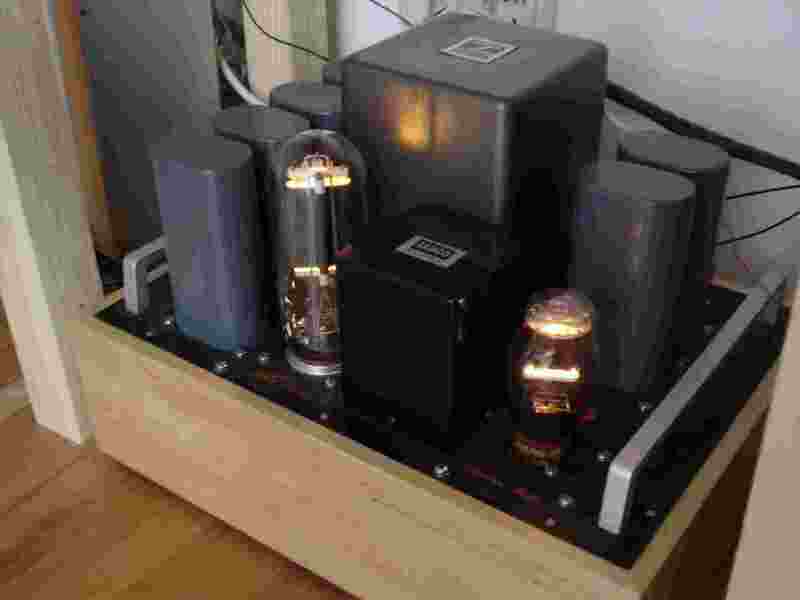 The Tau would be partnered with Thomas' fantastic tube amps. Friday afternoon, we joined those who came by to audition Thomas' various tube amp creations in two different set-ups. Everyone had a great time. 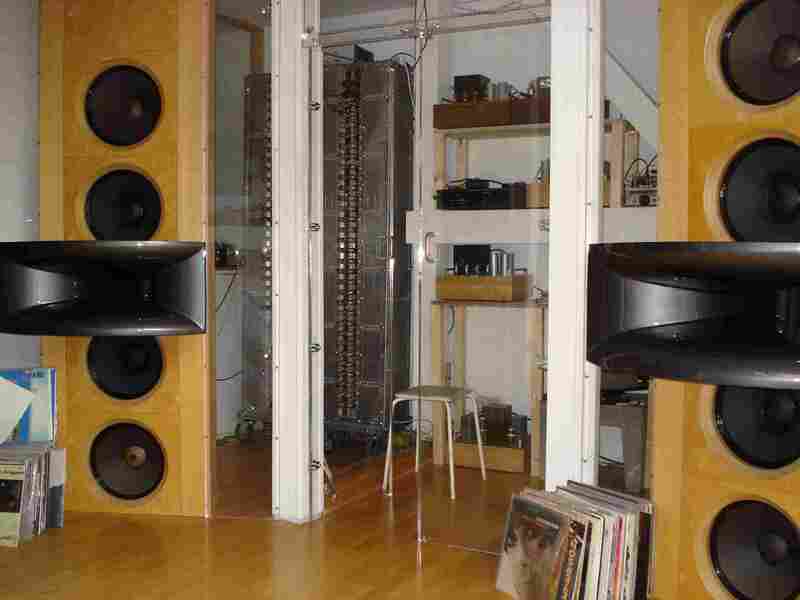 The big system used a Scheu Premier 2, SME V, Lyra Skala analogue front end and a California AudioLabs CD player as digital source and Thomas' infinite baffle loudspeaker system with two Altec 416A for the sub bass of each channel (50 Hz and below), two Wolf von Langa A515WVL field coil drivers for bass and lower midrange of each channel, which were provided by Wolf von Langa for the demo (Thomas uses two Altec 515B normally per channel) and a Wolf von Langa field coil compression driver for mids and treble section in an Iwata horn per channel. The amplification was the new LCR RIAA 6AM4 phono stage, a new universal DHT line stage with 801A triodes and a bi-amped SE DHT power amp setup per channel. The latter consists of a 211 monoblock (801A as driver) for the pair of 416A per channel, a SE DHT 801A stereo amp (6N7G driver and Tango interstage) for the 515 section and a SE 45 stereo amp (6N7G driver and Tango interstage) for the Iwata horns connected via a passive line-level crossover with Slagel TVCs for fine tuning of each amplification / chassis interface. 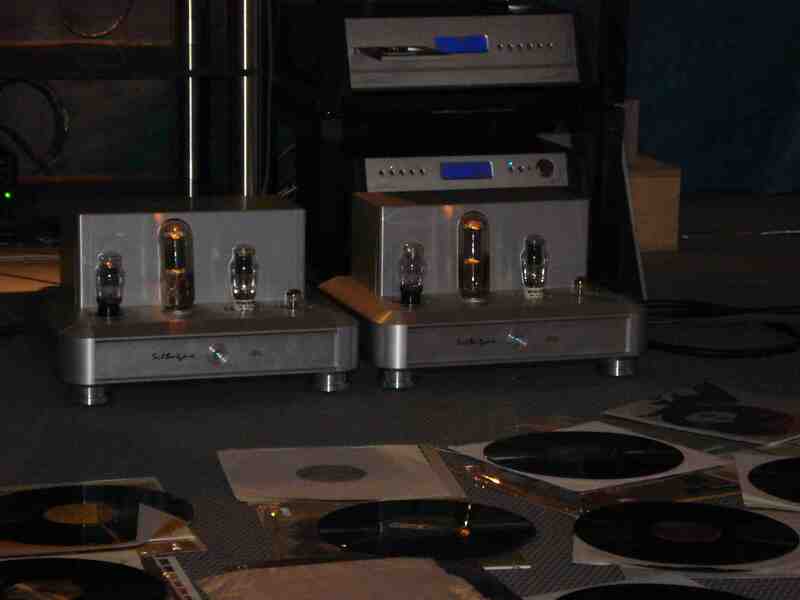 All amps were designed and built by Thomas Mayer and are his top-of-the-line components. The second system demoed was a smaller Scheu TT with SME M2-9 pick-up arm and Lyra Skala cartridge as analogue and David's private AH! Njoe Tjoeb 4000 CD player as digital source. 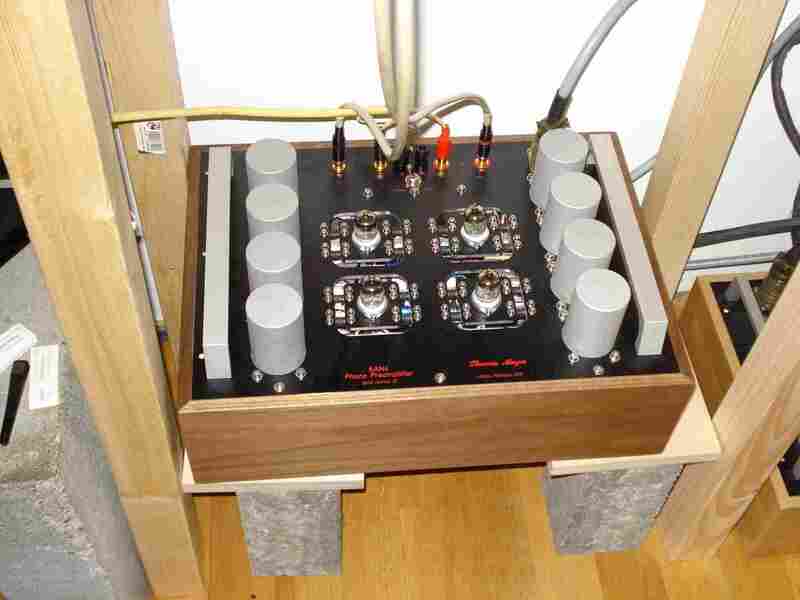 Amplification was all Thomas Mayer built: the octal pre-amplifier with phono and various SE tube power amps from the entry level 6HS5 single stage stereo amp to the 6N7 driven 6CB5A monos. The speaker of choice for this system was David's time-aligned 3-way speaker TAU. 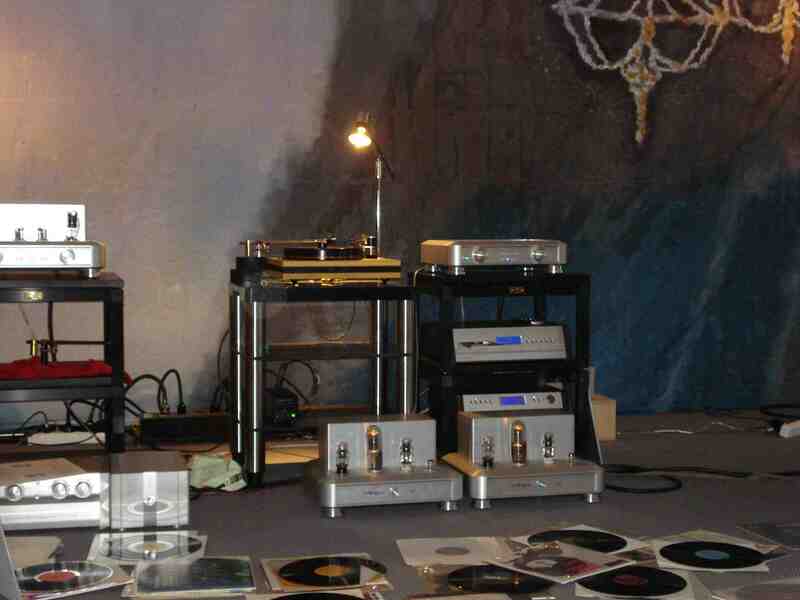 It was plain fun listening with both systems, so record after record and also many CDs were played with joy. Time was flying and there was never a sign of listening fatigue, which says a lot about the quality of both systems. The big system was, of course, the star of the demo, mainly due to the outstanding quality of the Mayer top-of-the-line tube amplifiers, but also due to the advantage of the huge diaphragm area the open baffle speakers offer (four 15" drivers per side is a statement) . The listening session (and David's measurements on Saturday) showed that there is still a bit of leeway to increase the performance of the open baffle speakers by fine tuning the passive crossover network further, although the overall performance as auditioned was impressive. We also used the TAU with the top-of-the-line equipment over the weekend. Paired with the 6N7 driven 801A SE amp (and fed with vinyl through the Scheu Premier 2 / Lyra Skala / SME V, the 6AM4 LCR RIAA phono stage and 801A DHT linestage) David's TAU showed its incredible musical abilities. The three-dimensional stage the TAU creates and the coherence over the whole frequency spectrum are the strong points of this speaker and make listening to music an unforgettable experience. This is definitely the best conventional speaker (here, I mean non-horn based) I have ever experienced. Period! What I heard at the High End the next day, independent of the price point, confirmed my opinion drastically. This weekend in Munich had another exciting surprise waiting for me and this started on Friday late evening (Thomas Schick had joined us by that time). The door bell rang at Thomas Mayer's apartment, and he told us that some guys were waiting downstairs to join us in visiting one of Munich's best cocktail bars. Down on the street, it turned out that these people were Mr. Michael C., the chairman of Silbatone Acoustics, South Korea and some of his friends. Also there were Joe Roberts of Sound Practices fame and, last but not least, Christian Rintelen, who had organized some of the previous ETF festivals. It was an incredible evening, and we really enjoyed listening to Mr. C., (who is an avid and well-known collector of Western Electric gear) and his friend Joe Roberts, who currently works as an audio consultant for Silbatone Acoustics. The hours flew by and we got lost in a lot of exciting stories about the legendary Western Electric cinema systems, amplifiers, drivers and tubes Mr. C. has collected over the years. We also were fascinated by the stories Joe told us that evening, for example about the US tube amplifier scene and big names of amp designers, such as J.C. Morrison. There was a lot of impressive-looking audio gear on demonstration in various rooms; the design and build quality were high-level, the prices too, but when these systems played some music it didn't touch me. It often let me leave the room within minutes because the musical qualities were - politely said - boring. The demo music played was also of little interest, to be quite frank. For example, I love Mark Knopfler and the Dire Straits, but if you hear this music in every third demo room and with uninvolving systems, it is too much. When we entered the huge Silbatone room I didn't expect too much after the experience we had had before. The room was filled with a lot of people, but David and I were fortunate enough to get a seat in the front rows. 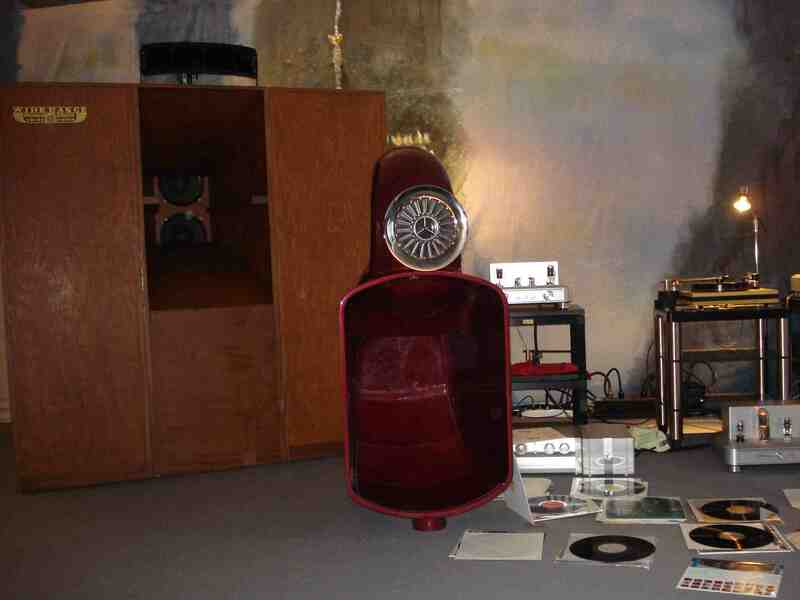 The minute I heard the first tones played via the big L9 Western Electric speaker system, I knew that it is something really special. This was going to be fun. And the Silbatone people, J.C. Morrison, Joe Roberts and others played really cool music, too. 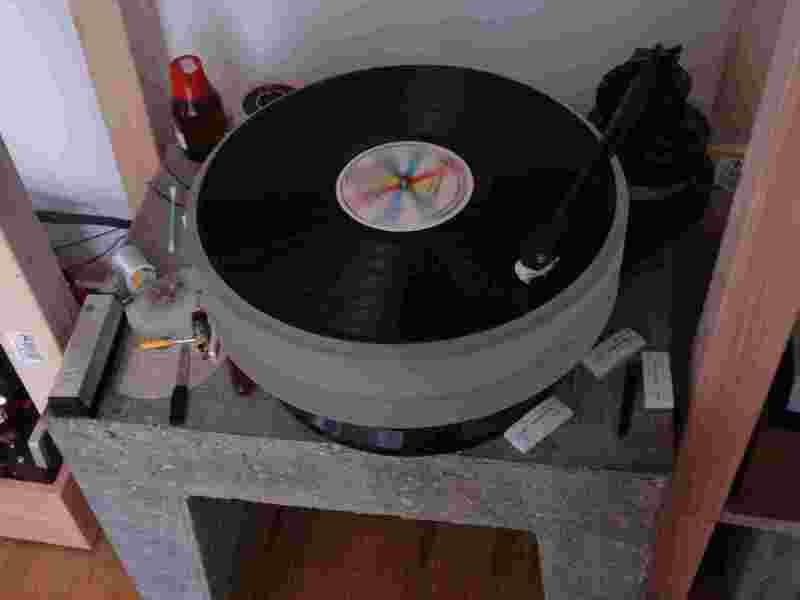 Mainly, 50ies and 60ies vinyl from jazz to blues to classical music was played via an Artemis Labs Schroeder SA-1 turntable through a new top level C-100 tube line stage with phono and a pair of SE 845 mono blocks with WE437A input and a DHT 10 as driver stage, which J.C. Morrison had built for Silbatone Acoustics. Yeah, that was by far the best system of the show in musical terms and "outplayed" the rest of the High End exhibitors with gusto. Of course, the treble detail and resolution wasn't the strong point of this more than 60-year-old WE L9 system, and the bass was lacking refinement and weight, but the musical performance and swing easily took care of those weaknesses. David and I stayed almost an hour in the Silbatone room and had a great time. Honestly, would the normal household have such a system in their homes, the young generation would still favor vinyl over mp3-files or CD. I am convinced of that. PS: Silbatone also has a 300B integrated amplifier, the JI300 Mk.III, for sale as well as a retro-looking horn loudspeaker, the Aporia 93 dB/1W full range horn unit, which uses one single customized flat-cone Manger driver from Germany. A pair of Aporias was at the Munich show, but unfortunately wasn't demoed when we were there. Hmm, 93 dB for a full-range horn system isn't much; maybe a cooperation with Austrian horn speaker expert David Haigner would be the ultimate quest for Silbatone to provide music enthusiasts with a no-compromise full range horn system combining the advantages of new technologies with the musicality, rhythm and drive of vintage equipment?